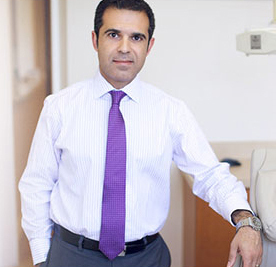 Dr. Farahmand has been practicing dentistry since 2002, offering high-quality aesthetic, general and cosmetic dentistry to patients throughout the Los Angeles area. Born and raised in Monterey, California, he moved to L.A. in his early teens and has lived here ever since. He holds an undergraduate degree from UCLA and a Doctorate of Medical Dentistry (D.M.D.) from the Boston University Goldman School of Dental Medicine. Committed to maintaining on the leading edge of dental practice, Dr. Farahmand continues to participate in advanced continuing education courses in a variety of practice areas, including implant, cosmetic, periodontal and endodontic dentistry, among others. Dr. Farahmand provides a full range of dental services and empowers his patients to take control of their personal and professional lives by dramatically improving the one physical attribute that most people see first: their smile. When he’s not practicing dentistry, Dr. Farahmand’s personal interests include biking and skiing, and spending time with his wife and son.